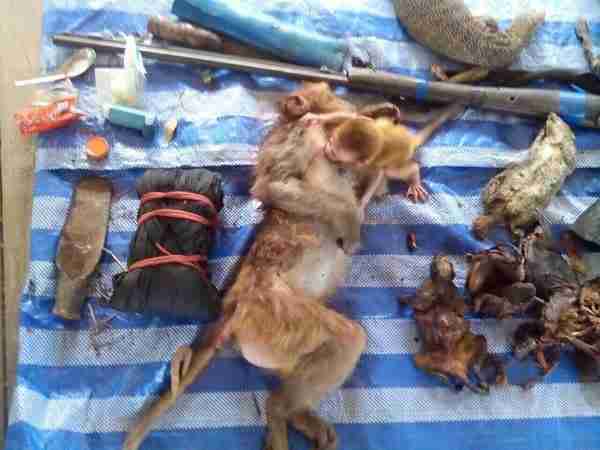 These photos capture the heartbreak of poaching in the quiet few moments after a mother monkey's death. 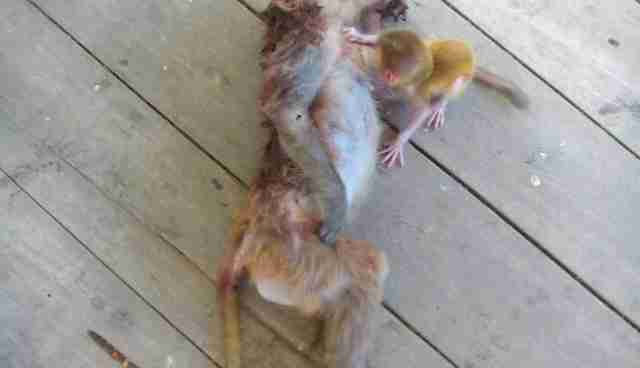 The mother rhesus macaque was shot and killed by a poacher in Thailand last June, and a wildlife official caught the poacher red-handed. Officials found her young baby still holding on to her. Not realizing she was gone - or perhaps not wanting to say goodbye - the little infant clung to her lifeless body, burying himself in her fur and nestling up to her to sleep. His world changed in the blink of an eye. But even in death, his mother was a source of comfort and love. 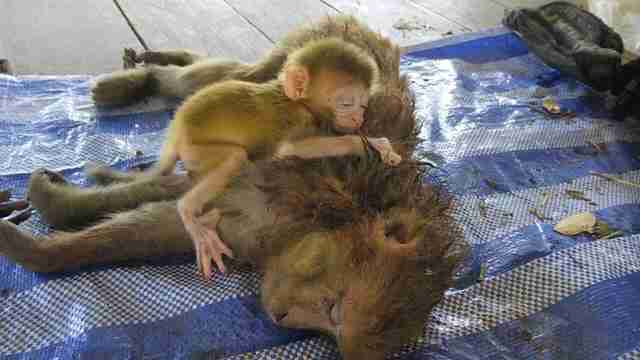 Unfortunately, this tiny monkey isn't alone. Each year, tens of thousands of animals are killed by poachers for fur, flesh and other body parts. Many of these are mothers, targeted only so their young babies can be plucked from their grasp and sold into the exotic wildlife trade. These babies are almost always destined for sad, short lives in circuses and zoos, in research labs or as private pets. 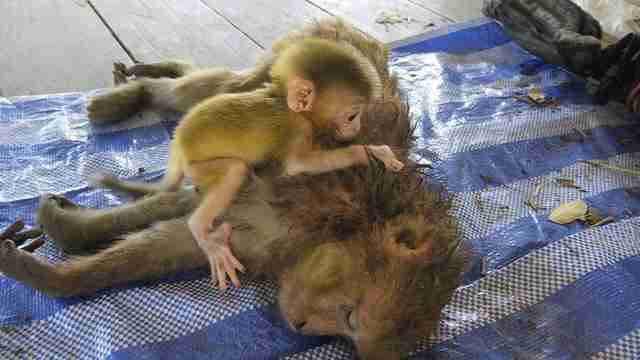 Luckily, the poacher who orphaned this monkey was arrested. 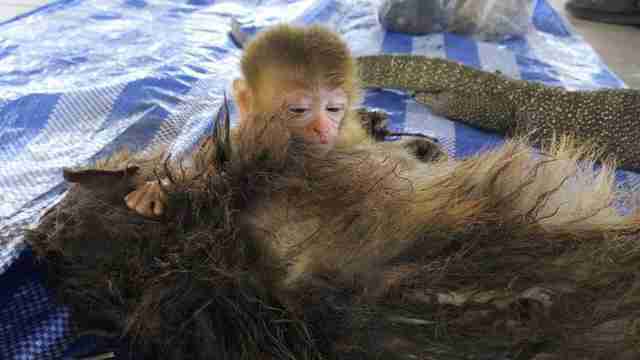 The infant was reportedly taken by officials to be raised at a government wildlife center. 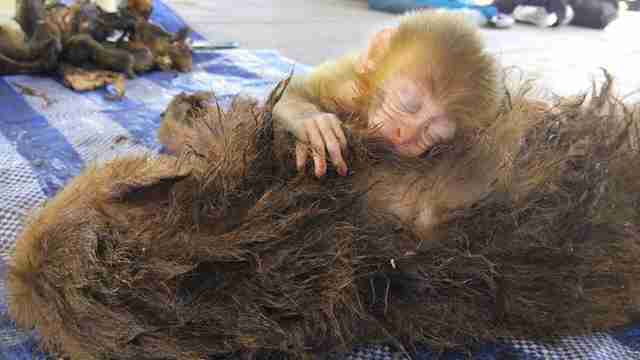 But while this little baby ended up in much better hands than the thousands of young animals who are sold into the wildlife trade each year under similar circumstances, he still won't be where he belongs: with his mother. The best thing you can do to stop this trade is avoid any tourist attractions that feature performing animals. If you'd like to help young animals like this one who have been rescued from the exotic animal trade, you can make a donation to Wildlife Friends Foundation Thailand.